A brand new Orangetheory Fitness Studio is celebrating the new year with an open house party in Aurora, Colorado in the Southlands area. High-Intensity Interval Fitness Franchise Continues Expansion With New Aurora Studio. Aurora, Colorado- January 12th, 2018, Orangetheory® Fitness, the scientifically backed and fast-growing fitness franchise, today announced that a new studio will be coming to Aurora, Colorado. The Aurora studio will be located in the Southlands Mall Shopping area just off of Smokey Hill Rd in Suite 134. With several studios now open in the state and several in development, the brand will continue to target the Colorado area for expansion. Owned and operated by Reggie Williams, the new studio will be conducting its open house party this weekend, from January 12th to the 13th during normal operating hours and will be announcing the winners to their raffle contest featuring gift cards and even a drawing for a 3-year free membership to Orange Theory Fitness, Southlands. The open house will feature amazing local vendors like J flex nutrition, Boulder running company and Preston from Axiom health Solutions. After the open house celebration at the Aurora Gym, prices will be going up. 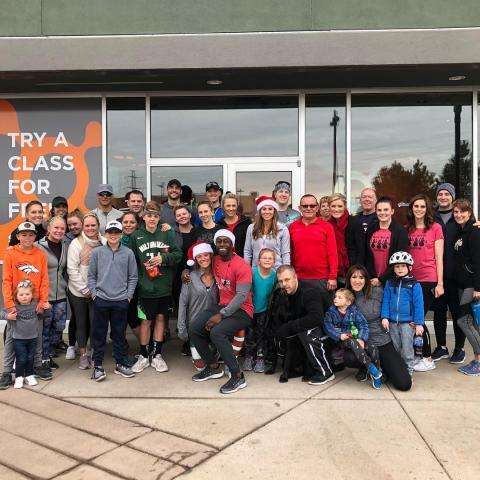 “We are excited to bring Orangetheory Fitness to the Southlands community and to help members live healthier, more vibrant lives,” said Reggie, Orangetheory Fitness Aurora, CO franchisee. Reggie also says they have a transformation challenge coming up, which is extremely popular this time of year is geared towards those folks who are looking to get fit for the new year. Transformation Challenge weigh-ins are the 18th-20th. The makeup day is on the 22nd for weigh-ins. The Aurora fitness studio is owned by Reggie Williams, who is known for delivering some of the most dynamic, challenging workouts that target your mind, body, and soul. His passion for motivating, and inspiring the teams around him is what he says has greatly contributed to his success. Reggie is a Nike Trainer, corporate Master Trainer, and the Managing Partner for the Southlands, CO Orangetheory Fitness franchise. He is also the former Owner of the Mt. Vernon Triangle/Shaw-Washington D.C. Orangetheory Fitness franchise, Regional General Manager of the VA/DC region and he served on the Board for the Workout Standards Committee for the Franchise Relations Committee for Orangetheory Fitness. Orangetheory Fitness launched its first studio in Fort Lauderdale, Fla. in March 2010, and has transformed into one of the world’s top fitness franchises, with more than 1,000 studios in 49 states and 18 countries. The 60-minute, five zone heart-rate-monitored interval training concept combines a unique trifecta of science, coaching, and technology to give members More Life. Orangetheory makes it simple to get more life from your workout. One of the worlds fastest-growing franchise companies, Orangetheory has developed a unique approach to fitness that blends a unique trifecta of science, coaching, and technology that work together seamlessly to elevate participants heart rates to help burn more calories. Backed by the science of excess post-exercise oxygen consumption (EPOC), Orangetheory workouts incorporate endurance, strength, and power to generate the Orange Effect, whereby participants keep burning calories for up to 36 hours after a 60-minute workout. Orangetheory has 1,000 studios in 49 U.S. states and 18 countries and was ranked #60 in Inc. Magazines Fastest Growing Private Companies List. For more information on the new Aurora Orangetheory Fitness and their membership packages, please call (720) 791-3003. More information on Orangetheory Fitness is available on the Orangetheory website at https://southlands.orangetheoryfitness.com/. Follow Orangetheory Fitness on Facebook, Twitter, and Instagram for the latest news and trends.